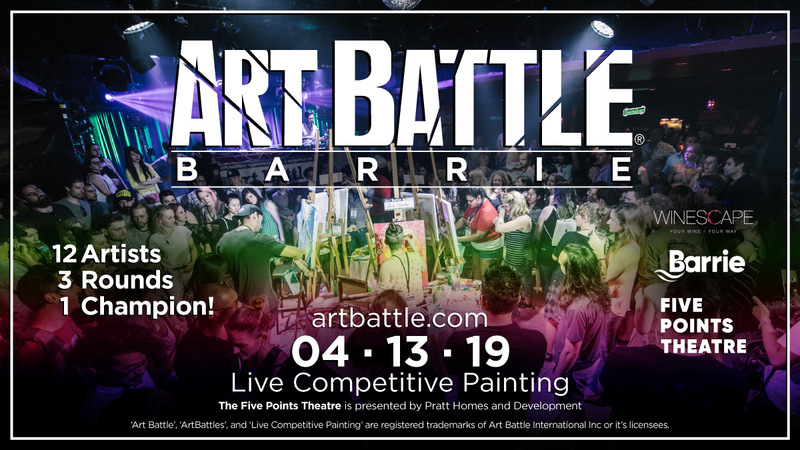 Welcome to the launch of Art Battle® Barrie! Grab your best pals and come enjoy an amazing evening of live competitive painting at The Five Points Theatre in Downtown Barrie. Watch the paint fly before your eyes during 3 twenty-minute rounds and vote to determine the event Champion! This event is a part of the Art Battle Canada National Tournament, and the winner will ‘move on’ to participate in the tournament as we move towards the July 25th National Championship event in Toronto. Art Battle® Barrie is presented proudly in partnership with the City of Barrie and Winescape.